After rain pushed the conclusion of the last quarter-final in the CaptiveOne U.S. Open Polo Championship® to Monday, Las Monjitas maintained their lead to defeat Equuleus 8-4 at the International Polo Club Palm Beach to claim the remaining semi-final spot. In the feature game of the week on the U.S. Polo Assn. 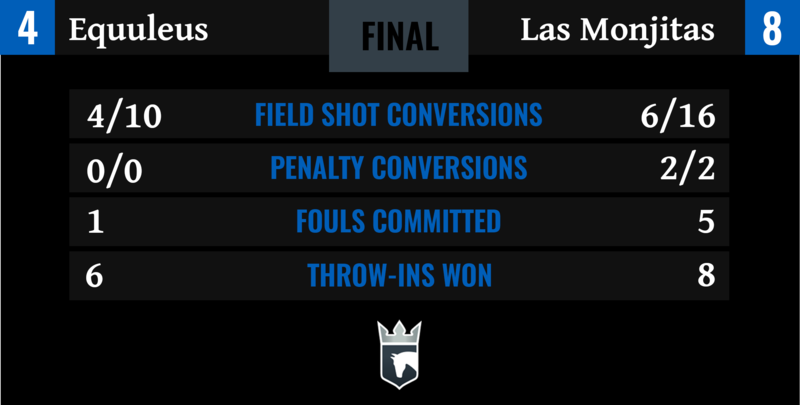 Field 1, Las Monjitas and Equuleus battled under inclement weather in a slow-paced, yet clean game with few fouls with Equuleus held to zero penalty attempts in the game. Las Monjitas focused on a possession-based attack by dominating the time on the ball, while Equuleus’ duo of Ignacio and Magoo Laprida were chased off the ball, limited to two goals in the game. The organized defence of Las Monjitas ultimately proved to be the difference across Sunday and Monday to claim the 8-4 victory. In front of the grandstand on Sunday, play began in a scoreless opening chukker that saw the ball remain in the middle of the field, with Equuleus holding a narrow advantage by producing four shot attempts at goal. The low-scoring game continued into the following chukker with Las Monjitas failing to record a goal, trying to run the ball downfield, rather than trying to open up play with passes downfield. Mariano Gonzalez opened the scoring on the receiving end of a pass from Ignacio Laprida, giving Equuleus the 1-0 lead. The potent offense of Las Monjitas came to life before the end of the half, led by 10-goaler Hilario Ulloa, who began to utilize the pass to find Francisco Elizalde in space. Assisting on two of Elizalde’s three goals in the chukker, Ulloa pushed Las Monjitas into the 3-2 lead at halftime. Beginning the second half with his fourth consecutive goal, Elizalde’s offensive efficiency contributed to the momentum staying in favor of Las Monjitas as they pushed their lead to three. With two minutes remaining in the fourth chukker, rain poured down, postponing the result until Monday to decide the final semi-finalist. Play resumed on Isla Carroll East with Equuleus looking to close the deficit, producing a two-goal fifth chukker behind goals from Magoo Laprida and Gonzalez. Reverting back to their fast-paced attack, Las Monjitas took advantage of Equuleus’ only foul of the game to convert a Pnealty 2 and maintain their three-goal advantage heading into the final chukker. A defensive final chukker resulted in Las Monjitas protecting their lead to limit the counter-attack of Equuleus, as the only goal of the chukker came on a safety conversion for Elizalde, his sixth goal of the game to advance Las Monjitas to the semi-finals with the 8-4 victory. Play continues at the International Polo Club Palm Beach with the first semi-final on Wednesday, April 17th at 5pm between Iconica and Pilot, followed by Tonkawa against Las Monjitas Thursday, April 18th at 10am.